What people usually refer to as the Classic Inca Trail is in the area of Cusco, Peru and has the destination of Machu Picchu. 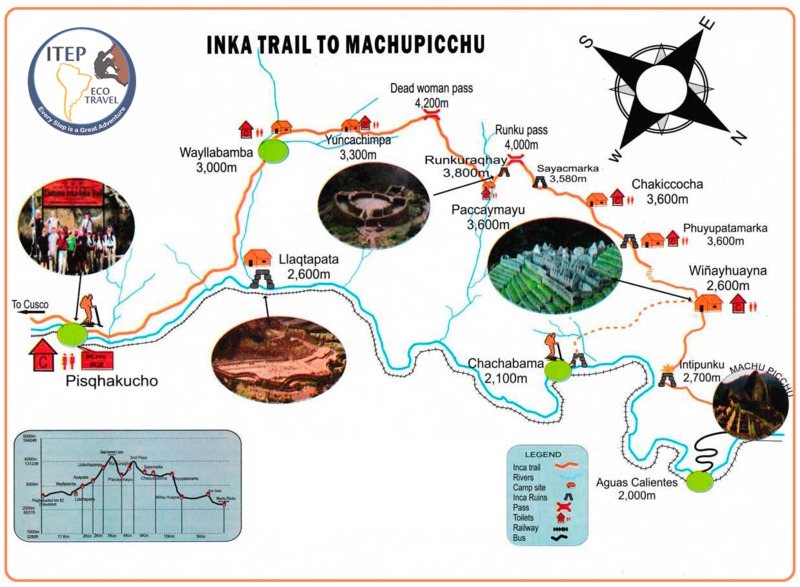 There are a few variations of the Inca Trail that you can follow to get to Machu Picchu depending on the route you follow and the time you have. The following is some information about the popular 4 day Inca Trail route with the last day being a visit to Machu Picchu. From Cusco, you will head out with your group and guide to KM 82 to start your Inca Trail trek. It should take about 2-2 ½ hours to reach KM 82 which also is our first check point for the Inca Trail. From the first checkpoint, we will go on a relatively easy hike (mainly flat) to our lunch site (Miskay). After lunch we’ll walk another 2 hours to Wayllabamba (a gradual uphill hike) where our campsite is located. We’ll reach our campsite at around 5:00pm. From Wayllabamba we will hike uphill until we reach the highest point of our Classic Inca Trail trek, Dead Woman Pass at 4600 meters. This part of the Inca Trail will take about 5 hours (7KM). From there we will go downhill for an additional 2 hours until we reach our camp at Paccaymayu at 3600 meters. From Paccaymayu we’ll hike one hour uphill to Runkuraqhay. From here we’ll hike an additional 1 hour to the second highest point on the Classic Inca Trail, Runkuraqhay Pass at 4000 meters. In another 45 minutes hike, we’ll be able to visit the Inca ruins of Sayacmarka. After visiting these ruins, we’ll hike about 25 minutes to get to our lunch site at Chakiccocha. After a hike of about 1 hour, we’ll reach the third Inca ruin Phuyupatamarka which will also be our last pass at 3600 meters. We’ll hike another 2 hours to reach Wiñayhuayna at around 5:00pm. Optional: If you still have the energy you can also go to the ruins of Wiñayhuayna before dinner which is about 5 minute from camp. At 4:30am we’ll start our hike to the first control point of the day for the Inca Trail. We’ll wait for a little while before they let everyone pass and then hike about 1-1 ½ hours to the Sun Gate where you’ll have your first view of Machu Picchu Inca City. From here we’ll walk an additional 30 minutes to the 2nd control point outside of Machu Picchu. We’ll enter Machu Picchu, have a tour, and after walking around Machu Picchu for a while, you will take a bus down to Aguas Calientes and catch your train to Ollantaytambo where we’ll pick you up and bring everyone to Cusco for the end of the trip.